Bridgeport Series 1 – 2Hp Vertical Mill s/n 204210 w/ Newall Topaz DRO, 2Hp Motor, 60-4200 Dial Change RPM, Chrome Ways, Power Feed, 9” x 42” Table. Sharp 1760K 17” x 60” Geared Head Gap Bed Lathe s/n 72450 w/ 80-1800 RPM, Inch/mm Threading, Tailstock, Steady and Follow Rests, Aloris Tool Post, 10” 3-Jaw and 4-Jaw Chucks, Coolant. Feeler / Jet mdl. PTL-59 Second OP Lathe s/n 700317 w/ 230-3500 RPM, 6-Station Turret, 5C Collet Closer, Coolant. 2008 Doosan MV3016 CNC Vertical Machining Center s/n AV4E0669 w/ Fanuc i-Series Controls, 24-Station ATC, CAT-40 Taper Spindle, 250 PSI Thru Spindle Coolant, Auxiliary Air Blow, Rigid Tapping, Hand Wheel Chip Conveyor, 18” x 39 ½” Table, Coolant. 2001 Daewoo MYNX530 CNC Vertical Machining Center s/n AV530033 w/ Fanuc Series 0i-M Controls, 21-Station ATC, CAT-40 Taper Spindle, 8000 RPM, Rigid Tapping, 30” x 20” Travels, Up-Graded Oil Cooler, Hand Wheel, Chip Conveyor, 20” x 39 ½” Table, Coolant. 1994 Fadal VMC3016 4-Axis CNC Vertical Machining Center s/n 9409898 w/ Fadal CNC88HS Controls, 21-Station ATC, CAT-40 Taper Spindle, 7500 RPM, High Speed CPU, Graphics, 16” x 36” Table, Coolant. Chevalier / Proto Trak mdl. FM-32HP 2-Axis CNC Vertical Mill s/n HP855079 w/Proto Trak M2 Controls, 3Hp Motor, 60-4500 Dial Change RPM, Kurt Power-Lock Power Draw Bar, Chrome Box Ways, 10” x 50” Table. Hardinge Cobra-42 CNC Turning Center s/n C-301 w/ Fanuc Series 21-T Controls, 12-Staion Turret, 16C Spindle, 5C Adaptor, Coolant. 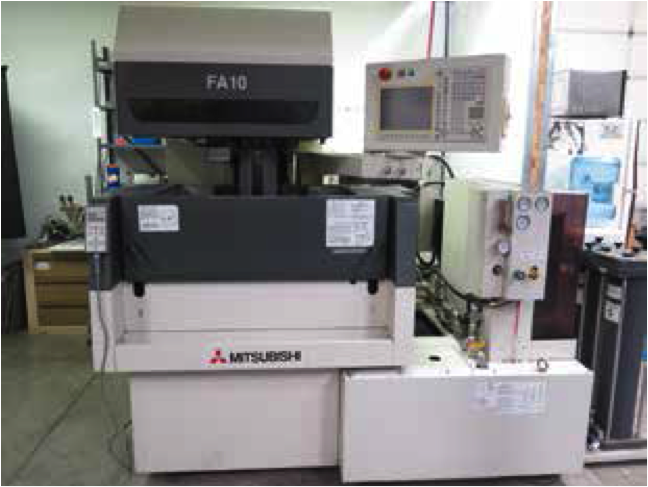 2001 Mitsubishi FA10 CNC Wire EDM Machine s/n 01A10129 w/ Mitsubishi FA-1 Controls, Teach Pendant, Auto Threading, .004-.012” Wire Cap, 21 Deg Draft Angle, 10 5/8” x 19 ½” Open Work Area, 8” “Z”, DI System, Coolant Filtration System. Fadal VH65 4th Axis 6 ½” Rotary Table w/5C Nose and Closer. Kurt 8” Angle-Lock Vise.R8 Tooling and Collets. Ellis 6” 3-Jaw Compound Dividing Chuck. Die Shoe Sets.Electric and Pneumatic Power Tools. 24” x 36” x 3” Granite Surface Plate. Mitutoyo 0” to 15” OD Mics. 6” x 6” Magnetic Compound Sine Table. 2-4-6 and 1-2-3 Blocks, V-Blocks and Parallels. Allis Chalmers CP50XL PS SNGL 4250 Lb Cap LPG Forklift s/n HBP514660 w/ 2-Stage Mast, 186” Lift Height, Side Shift. Chevalier mdl. FSG-3A818 8” x 18” Automatic Hydraulic Surface Grinder s/n M389B001 w/ Walker Fine-Line Electromagnetic Chuck, Coolant. OmniGrind 6” x 12” Surface Grinder w/ Magnetic Sine Chuck, Pope Spindle. Rousselle No. 2G Hydraulic C-Frame Press w/ 18” Throat, 11” x 16” Bolster Area. Clausing Startrite mdl. HB250M 10” Horizontal Band Saw s/n 139871. Bantam mdl. B212 12-Ton Pneumatic Press Brake s/n 2169 w/ 5 ¾” Throat, 6 ½” Open Height. Tennsmith mdl. 13616 16GA x 37” Kick Shear s/n 17272. 2008 Atlas Copco GX 7FF 7.5Hp Rotary Screw Air Compressor s/n CAI305441 w/ 17,448 Hours. Miller Millermatic 250MP Microprocessor Controlled CV-DC Arc Welding Power Source and Wire Feeder s/n KE597291. Hobart Handler 120 CV Welding Power Source / Wire Feeder. Miller Dialarc HF AC/DC Gas Tungsten / Shielded Arc Welder s/n HJ126848. Sweco mdl. FMD-11R Media Tumbler s/n 620607-A-1295. Central Machinery 6” Belt / 8” Disc Sander. Databank 2-Door Safe 50 ¾” W x 71 3/5” H x 35” D.